The concentration camp memorial site Kaufering VII represents a dialog of history and memories. Every single memorial stone, donated by a European head of state in remembrance of the deported and murdered Jews from their home country, describes in its own way the importance of the memories of the great loss of the Jewish population of the respective nations. They have been put up at a central spot, the former „Appellplatz“ (the place for roll call). Vis-à-vis there are twelve granite steles symbolizing the eleven Jewish concentration camps of the concentration camp commando unit Kaufering and the SS labor camp Landsberg situated at the airport Penzing. At the same time they also symbolize the 12 Tribes of Israel . In the Eastern corner of the ensemble a memorial stone donated by the French and American liberators warns: “Never again”. In the Western part the citizens´ association put up a memorial stone dedicated to the Jewish victims because neither federal president Herzog nor federal president Rau were willing to donate a German memorial stone. The central memorial area is completed by four small stones dedicated to victims of the concentration camp commando unit Kaufering whose names are known. I In 2004 a further design element was added – seventy-two concrete steles. The number 72 stands for the number 12 (for the 12 Tribes of Israel) multiplied with 6 (for the 6 million Jews that were killed in Europe). On top of each of the concrete steles you can find a stone of remembrance, part of the Jewish honoring of the dead. The concrete steles are linked to each other by a wire mesh. This wire mesh of the additional design element symbolizes the mesh of lies, racism, defamation and anti-Semitism that characterized Germany during the Nazi dictatorship and finally led to the Holocaust. But it also symbolizes the mesh of concentration and extermination camps that were spread out over the whole of Europe. With its design this installation "Leid, Tod und Hoffnung" (suffer, death and hope) shall also remind of the former fence of the camp. This fence separated the concentration camp internees from their previous lives. Behind the fence they were exposed to complete arbitrariness and were deprived of their human dignity. The fence was a symbol of hopelessness, hunger and death. In the Northern part of the installation you can see an iron wire mesh and on top of it there lie twelve fallen concrete steles. They represent the twelve years of the Nazi dictatorship that also ended in April 1945, the time when the concentration camp commando unit Kaufering was liberated. 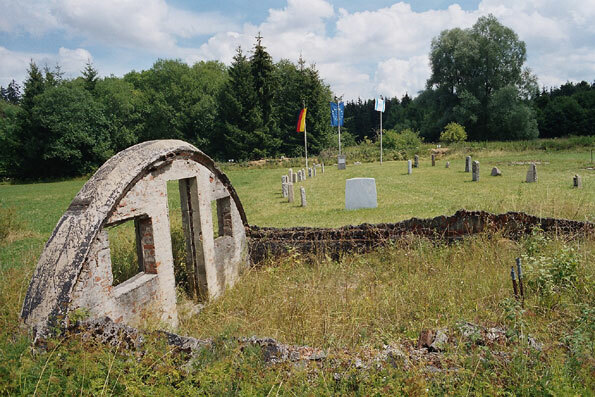 All elements are not only related to each other but also to the historic context and the constructional remains of the concentration camp underground bunkers, the uncovered foundations of the different shacks and the contours of the concentration camp huts that are recognizable on the ground. At the entrance to the former concentration camp an information panel explains the historic context of the concentration camp of the commando unit Kaufering. A historic tipping truck from the concentration camp Kaufering X clearly illustrates the inhumane drudgery the Jewish concentration camp work slaves had to accomplish.